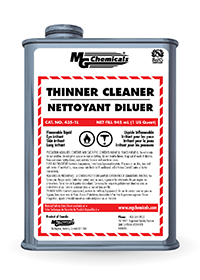 The 435 Thinner is a super fast drying thinner, low VOC solvent for use with the MG Chemical’s conformal and EMI/RFI shielding coating products. It is designed to ensure good adherence to plastic substrates. This fast drying time of the 435 makes is a good choice for spray application of EMI/RFI shielding and conformal coatings that require low VOC and need quick drying times.